Drive Network is a web hosting provider based in Japan. The vendor provides rental server solutions from Seapoint Corporation. The firm prides themselves on being a JPRS Designated Business Operator. Drive Network was founded in 1996. The vendor offers shared rental server solutions to businesses in Japan. Its servers are redundantly configured with RAID 1 or RAID 5. Its data centers are located in Japan. 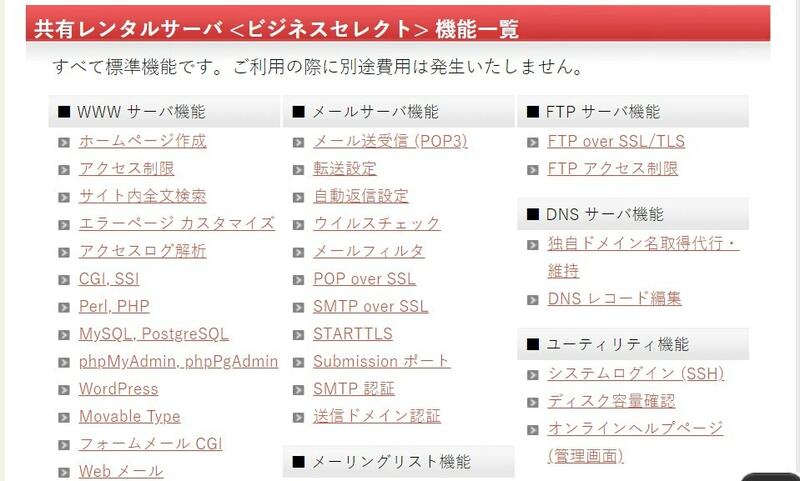 Drive Network’s website is only available in Japanese. Drive Network’s shared rental servers are hosted in robust, modern data centers in Japan. The data centers are designed with high earthquake resistance; they are able to withstand seismic intensity of severe earthquakes. Furthermore, the data centers are connected to a redundant backbone network of up to 1 Gbps and are under 24/7 surveillance. Drive Network servers are RAID 5 protected to ensure maximum protection of your data and come with Intel Quad Core processors. Drive Network employs isolation protocols in its shared web hosting solutions to ensure that websites with higher demands for resources do not affect other smaller websites with which they share a server. Its servers run on FreeBSD operating system for stable and improved performance which makes them suitable for critical and heavy workloads. This vendor’s private rental server solutions give its customers robust and high performance because it is not shared with other customers. The shared rental server solution, on the other hand, takes a different approach to hosting. While it only includes basic features and is not as high performing as the private server solution, it is definitely pocket-friendly. This company provides daily backup services giving its clients a way to recover their website data even after losing it following a disaster. 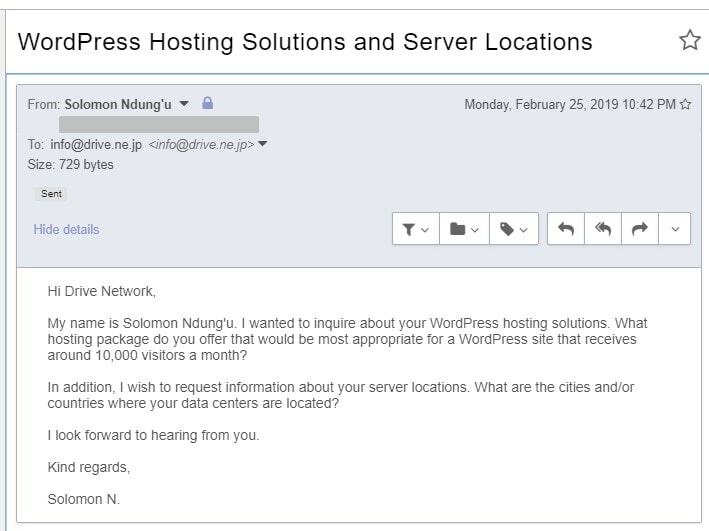 It also offers remote backups in physically different data centers from both Toyama and Tokyo data centers, the vendor’s primary data centers. Drive Network’s free SSL certificates are a big plus but it also offers advanced SSL certificates at a fee. Drive Network’s website is extremely unappealing and in no way user-friendly; navigating it is a big hassle. Drive Network’s hosting solutions are quite inexpensive. The prices are listed on its website in Japanese yen. The vendor offers flexible, monthly and annual billing cycles. The company does not have a free trial period or a refund policy. However, it offers a 99.99% availability and uptime for its rack rental solutions. You can contact Drive Network customer support team via telephone or email. The firm has no ticketing system or live chat support. Customers in Japan can also visit the offices during business hours from 9:00 a.m. to 6:00 p.m. JST on weekdays. It is not available 24/7 and is highly unresponsive. My email to this team went unanswered. All the same, the vendor has a fairly detailed knowledge base, which you can use to attempt to resolve issues on your own. Drive Network leverages its experience and expertise in the hosting industry to make a case for more businesses to join its notable customer base. The veteran hosting vendor has invested in a hosting infrastructure system that can handle even large websites with complex databases. Wondering how Drive Network stacks up against other Web Hosting companies? Enter any other Web Hosting company and we will give you a side-by-side comparison.